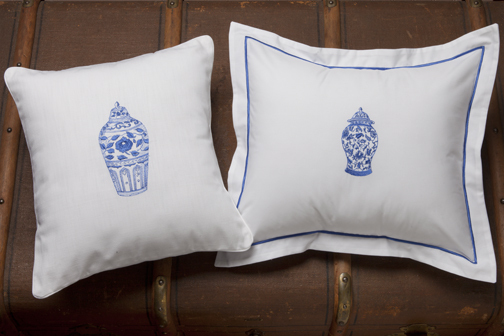 Jacaranda Living is so excited to be launching a new collection of embroidered linens featuring the classic blue Ginger Jar on both a white pallet and on natural linen. A wonderfully unexpected and fresh complement to any room, the popular Ginger Jars as blue and white decor accents will make any room pop with delight. 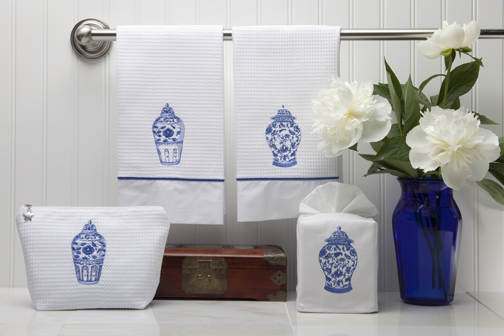 Recognized for their wide selection of classic and contemporary embroidery designs, the Ginger Jar is a natural fit for Jacaranda’s bed and bath linens. Owner Cathy Deale explains that the Ginger Jar was always used as a storage canister for food staples including ginger. Today, Cathy wants to bring back the historic Ginger Jar and is launching it as one of her new products. The product has the character for double happiness and have often been given as wedding gifts. “We chose the patterns with flowers because of our love for flowers at Jacaranda Living!” says founder, Cathy Deale.